Oh,no, I like this one the best with Bells as Big Brother! as much as this pains me i have to register a phoned in vote for this one as well....doesn't anyone care about blurry bunnies for crissakes! This is the one. Oh yes. It has that same quality that the Bells/Nuage photos have...that don't mess with me...somebody's got my back...thing. And the lettuce relates better to better Bells. ...and isn't this the famous "Nibbler" of nibbler throws 1&2? why yes lisee it is!!! isn't he the best?!?! 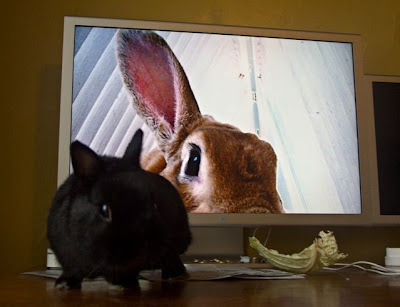 what a remarkable memory you have and despite his fathers photographic skills, i'm sure it's reflective of the fatc that he's such a remarkable bun! sorry foonus, obviously i'm a little sore about losing the editing contest. you did too though, a vote came in today for the top image. so there!